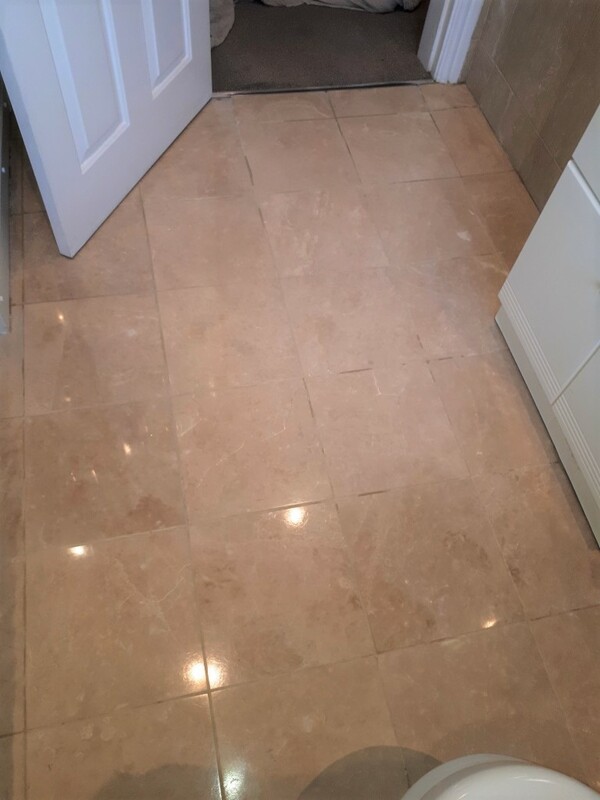 Our customer had a polished Marble tiled bathroom floor which had been installed some years ago. Over the years the tiles had become water stained and marked and although the customer had tried various household products to remove them they had not had much success. The floor was now really annoying them and so they decided to contact Tile Doctor to see if the problem could be resolved. Marble is often the preferred choice for bathrooms giving them what can only be described and an opulent feel. It is highly durable, tough and usually of premium quality. However, like any natural stone it is in fact porous and needs to be sealed to prevent dirt becoming trapped in its pores as once that happens it can be very difficult to keep clean. I visited the property in Brownhills, a historic mining town to the north east of Walsall to see if I could help, I surveyed the bathroom and could see the staining that they had mentioned was quite pronounced. I advised the customer of the options that Tile Doctor could offer, and we agreed a price for the work. To clean and polish stone tiles such as Marble we use a process we call burnishing. This involves the application of different grits of Diamond encrusted pads in sequence from coarse to very fine. No chemicals are used in this process, just water and in this case a setup of small six-inch burnishing pads which fit to a hand buffer. I started with the application of a coarse 400-grit pad lubricated with water which successfully removed the marks from the Marble. 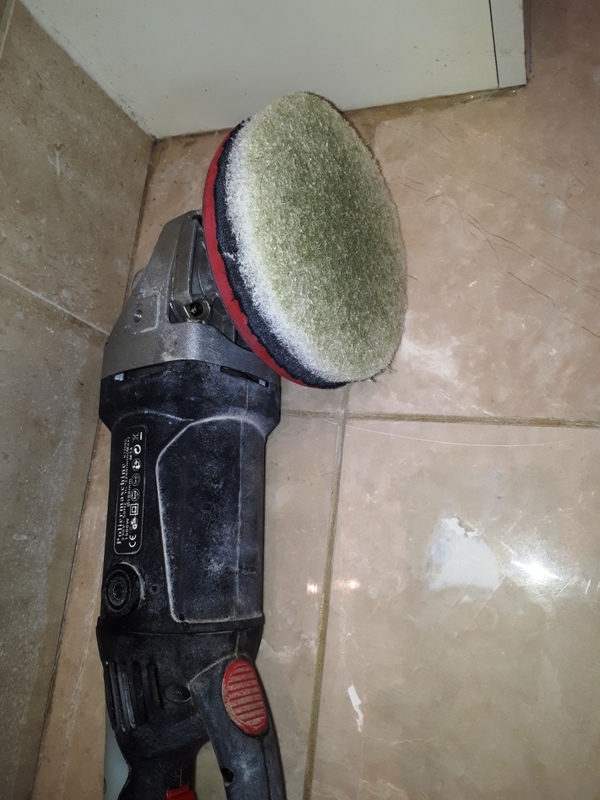 This pad does dull the appearance of the stone so that has to be gradually restored by working up through the finer set of pads rinsing the floor in between each pad with water. The last pad to be applied is a very fine 3000-grit pad which is applied with a little water sprayed onto the tile and results in a lovely polished finish. The customer was happy with the results, however they had previously mentioned that they liked a very deep shine, so I recommended we build the polish further with the application of Tile Doctor High Shine Powder. 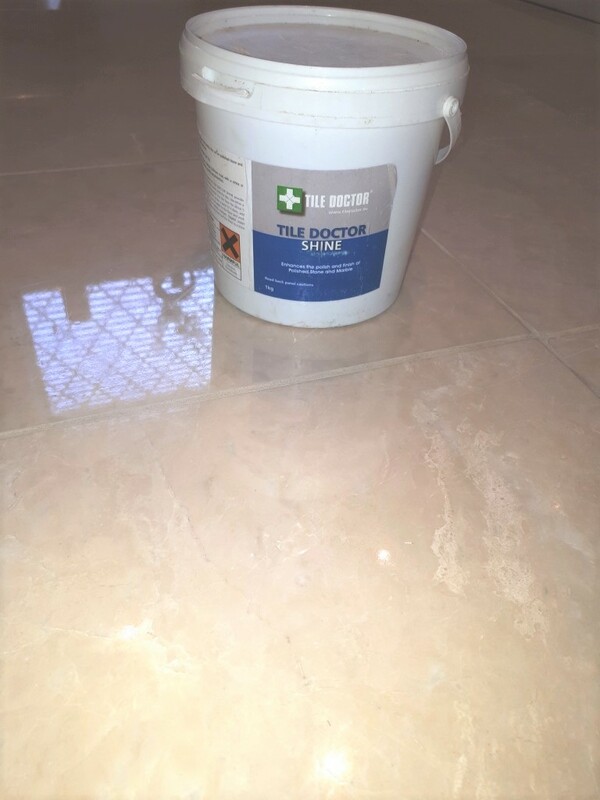 Tile Doctor High Shine is a crystallising powder that provides a very high shine and tough durable finish. It can be used for all-natural stone, such as marble, limestone and granite so was an ideal choice in the instance. 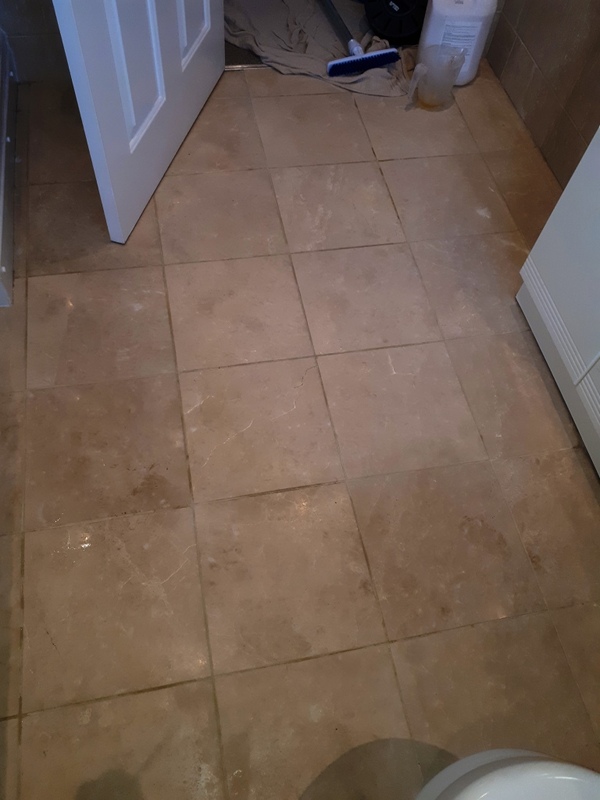 The customer agreed so the crystals were buffed into the Marble to give an even deeper shine finish that not only looks great but adds a durable barrier to the floor that will protect it from staining in the future.